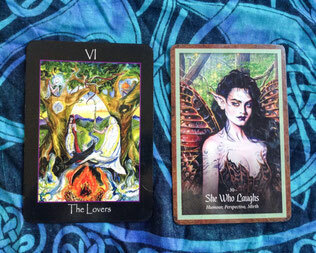 Today I have an exiting new Tarot Spread for you, the Wild Path Spread. 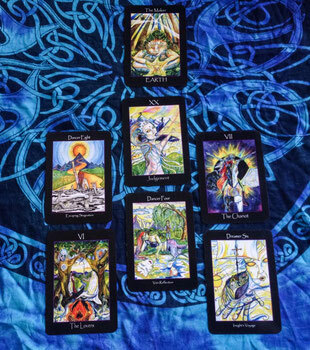 This spread is a follow up of my „Embrace your Wild Self“ Tarot Spread, but it focuses on different areas and so you may also be interested in this one. Taking the Wild Path may mean different things for different people, for example the reason I created this spread is that I definitely need to unplug, finding back to the untamed, spending more time in the wild places, and also stepping away from some of the responsibilities when it comes to social media. Over the last year I’ve spent so much time and energy on constantly creating videos to guide others in the world of Faery, or lessons about the Ogham for example, that I had way to little time to do those things myself. Unfortunately I am very much a perfectionist, and I will not create things halfheartedly, so I need to get those things out of my system and so I will push on until everything is done. But now it is time for me to leave that perfectionism behind and to let the wild part of my soul take over. Also I am just taking new approaches to my own spiritual journey, so it is also about finding the courage to step into the unknown. 1. How does my mind effect my Wild Self? 2. How do my feelings effect my Wild Self? 1. 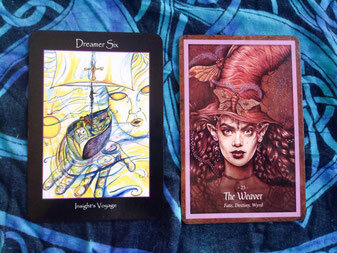 What I get here from the Lovers card is that when it comes to my mind, to my thoughts, that I am not fully committed to the Wild path yet, this has to do with the fact that I still have some work to do before I can fully allow myself to take a step. The important message for me here is that I need to learn to unify mind, body, and spirit, and the way that I ask the questions, the separation of mind and feelings, may not be right for me. I separate those things instead of unifying them. The Oracle card tells me that I am to earnest in my mind, and yes this is spot on, in order to walk the Wild path I need to lighten up and take a more light hearted approach. I cannot think of it as just another thing to do, but I need to find back to the joy it will bring me, if I allow my mind to calm down I will find that bliss again that I’ve experienced already so many times before when I took that path. 2. When it comes to my feelings, there is a strong sense for the need to find myself again, as for some time now I always felt a bit like I’m just floating, where I just need to function, and the part of my life where I wanted to dive deeper into the mysteries of life has been neglected by myself. It also shows me the strong pull to go away for a while, and this makes complete sense, as very soon I will take a ship and cross the waters to take a vacation. Otherwise, the owl in the front leads the way to the voyage to my inner wisdom. Now the Oracle card shows me the urge of my feeling that I have to find my own place in this web of my own small life, but also to find my place in the bigger picture of the universe, how much of an impact do I leave in this world, if any at all, this may be things and questions I need to explore a bit more. 3. 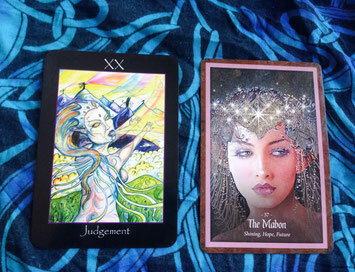 This card is no surprise at all, so the first step I need to take is to leave the muddy waters that may have brought some confusion, but also it feels like I have been dwelling in something like a „spiritual comfort zone“, where you stay because it is something you know and it is easier to stay there than to go somewhere unfamiliar. For to long feelings and thoughts have circled around the same themes in my life, and there was no going forward. There is definitely a sense of stagnation and also the need to go back to the things that truly matter to me, other than pushing through the things that I think I need to do, but do not bring me the satisfaction I long for. the world, but I can work from the background. I should know that I have the tools I need to create my world anew and also that now is the moment to connect and communicate with my allies to plan the coming time. whole process, to see it as an opportunity for a new beginning, and that my inner light can be rebirth if I let it happen. So I will probably have to remind myself of this over and over again. 5. The blessing on this path is that if I bring all aspects of myself, mind, body, spirit, light and dark, together into my heart center I will gain the power to move forward in life more effortlessly. It also tells me that I will find the courage to open myself fully and truly let my heart speak in all of the actions I will take. Finding the pure power of my heart energy. The Oracle card suggest that there will be more passion, more power, a fire energy and the desire to live my life fully and truthfully. It also gives me a sense that my creativity will easily pour out of me, and that my future projects will benefit from this creative fire. 6. The best way to nurture it, is to just heed the calling, to answer it and follow my life purpose. Acknowledge the opportunity that is given to me at this time. What is also interesting in this card, is the position of the great glyph, you can see it on the Sidhe lower back, which represents the basics needs of life, a sense of survival, taking care of the body, enjoying the simplicity of life, those are the things I should nurture, the things that my Wild Self is longing for. This is a time where I should not look back anymore, the Sidhe being wants me to look in front and to put my energy into the future. The call is loud and clear and it echoes from many different places. 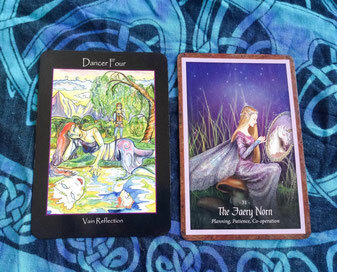 The Oracle card suggests a similar meaning, with the light that will be rebirth, so another way to nurture my Wild Self is to stay focused on the future and feed it with hope, faith and trust. 7. The best way to stay true on my path is to keep working with the earth energy, as it keeps me grounded and prevents me from flying off, also my own magic comes from deep within the earth. It also reminds me to connect with the trees, or better to stay in contact with the trees, and also to loose myself and find myself again in the forest, if that makes sense, well it does to me. 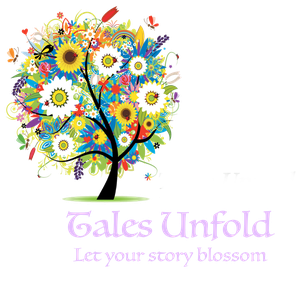 Let the wisdom of the tree grow within myself. The Oracle card indicates that in order to stay true on my path I have to take care of my feminine needs and I need to surround myself with things that are alive, with things that are able to grow and thrive. This may be plants and trees, but also my creative projects that I’ve started, so bring life into them and let them grow and let them take over for now. Simply invite and embrace the things that give you a sense of fulfillment in your life and know you can start over at any time, you just have to make the decision to do so. 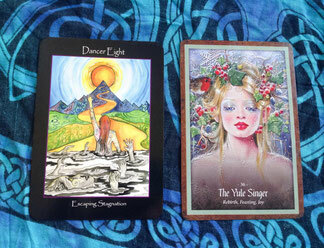 I used the Tarot of the Sidhe and the Faery Forest Oracle for this Reading. 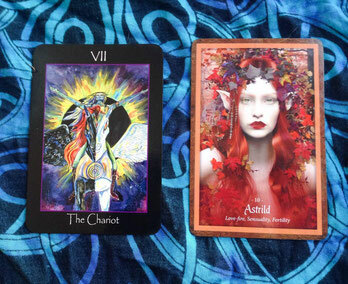 I hope that this spread may help you on your own Wild Path, and that you can get some insight if you try this for yourself. 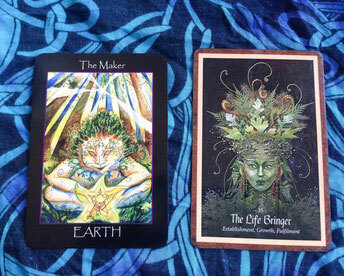 If you would prefer that another person does this reading for you, just have a look here.